The sudden passing of George Michael in the UK this morning has resonated deeply with fans in China. The iconic pop star was the first foreign pop act to perform in China, at Beijing's Workers' Stadium. The show has been viewed online over 8.5 million times and received 2700 comments. The legendary concert on April 7, 1985, will be remembered for years to come. In March 1985, Wham! took a break from recording to embark on a lengthy world tour, including a ground-breaking 10-day visit to China, the first by a western pop group. 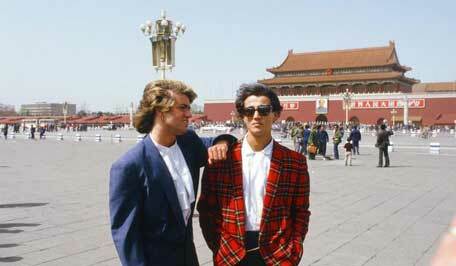 On April the 7th that same year, George Michael and Andrew Ridgeley's band Wham! played to a crowd of 15,000 people at Beijing's Workers' Stadium. The concert came one and a half years after Wham! became Britain's biggest pop act. Their debut LP Fantastic spent two weeks at No.1 in the UK album charts in 1983. And the group's song "Last Christmas" became the highest-selling single ever to peak at No. 2 in the UK charts. George Michael's solo piece "Careless Whisper", and Wham! 's "Freedom" also became UK chart-toppers, following the band's break-out single "Wake Me Up Before You Go-Go." It's hard to fathom the revolutionary impact of a visit from any foreign band, let alone one that at the time was one of the most popular acts worldwide. The mid 1980s was the time when Chinese pop scene started taking shape, when youngsters began to be mesmerized to albums of pop singers from Hong Kong. And Chinese knew little about foreign bands. So Wham! 's concert marked a new era of China's pop music scene. British director Lindsay Anderson accompanied Wham! to China and made a documentary film about the visit. The one-hour and 18 minute film entitled "Foreign Skies: Wham! In China" recorded the spectacular event and the impact it brought to the Chinese pop scene. The sudden passing of George Michael in the UK this morning has resonated deeply with fans in China.